Or I just flew in from Seattle and boy are my arms tired. 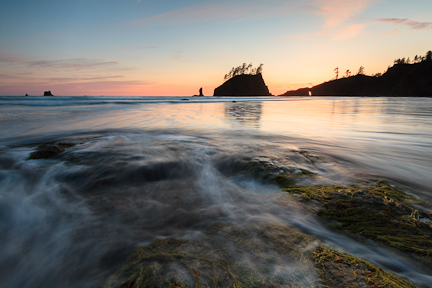 I recently attended Art Wolfe’s Olympic Peninsula workshop. What an amazing place the Olympic Peninsula and the Olympic National Park is – Rain forest, Mountains and the ocean. What more could you ask for? It was quite an experience. I was expecting a relatively intimate workshop (I had been under the impression that it would be 12 people) that would give us all a lot of time with Art and Libby and Jay. It turned out to be a much bigger group, ~30 participants and 4 or 5 additional instructors/assistants. Not that is a bad thing, the staff were all pretty attentive both in the classroom and in the field, although I found it difficult to keep track of peoples names, whether they were with our group or not and whether they were a participant or instructor. We didn’t spend too much time in the classroom because the weather was ‘perfect’ for photography, it was overcast the first day, overcast and rainy the second, but then cleared so that we got broken cloud cover for a sunset at Second beach. Very cool the way the weather worked out perfectly. One of the reasons that I took the workshop was to get a better sense of photographing in forests and there was no shortage of opportunity to photograph in the forest. Our first stop was Marymere falls and then on to the Sol Duc. Being in dense old growth forest I was overwhelmed by the clutter and so it wasn’t until I was in the Hoh Rainforest the following day that I actually started seeing potential shots. But then however I was battling a couple of technical challenges that I hadn’t expected – it was raining, hello rainforest – which meant that I had to clean off the front element frequently otherwise my shots would be obliterated because of raindrops. The second issue that I was frankly surprised by was fogging. I was using a polarizer to take the sheen off the green and found that the front element would fog under the polarizer and so I had that to contend with too. Most if not all of the shots of the forest I ended up with are marred by one or other of these issues. While I may not have any photographs from the forest that I liked, I did begin to ‘see’ potential photographs which was a significant step forward for me. I’m looking forward to going back for more!